Let’s say you have run the DNA of your study species on a next generation sequencing machine, such as Illumina HiSeq. You now have a huge collection of short sequences to make sense of. The data is a text file that is too big to open in a regular text editor. The first bit includes the machine name and information of the run and position of the cluster on the flowcell. The first line ends with the barcode sequence. 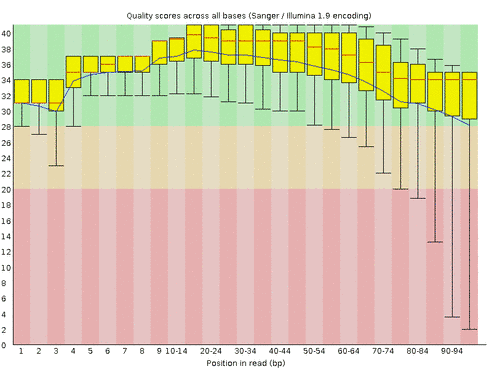 Then follow nucleotide sequence and a quality score. The quality scores can be in various formats. You will want to have a closer look at the data quality before you proceed. The fastcq toolkit is very useful for this.